The most convenient airport to the University of Maryland is Baltimore-Washington International (BWI). Taxis, public transit, and Amtrak trains provide ground transportation from the airport to the wider DC-Maryland region. For more information on getting to and from BWI, visit BWI’s ground transportation page. Another option is Ronald Reagan Washington National Airport (DCA). This airport is adjacent to DC and is accessible by taxis and the Metro system. However, as National sits across the District from College Park, your commute to and from this airport may be longer. There are two Amtrak stations near College Park. These are New Carrollton Station in Maryland and Union Station in DC. While New Carrollton is geographically closer to College Park, Union Station is actually the more convenient commute, both by car and by public transportation. Both Amtrak stations are also at Metro stations; New Carrollton is on the Orange Line and Union Station is on the Red Line (see below for information on navigating the Metro system). Both stations also offer taxi and regional shuttle services. For train schedules, fares, and accessibility, please visit Amtrak’s website. The University of Maryland at College Park is served by the Metro Green Line’s College Park Station. 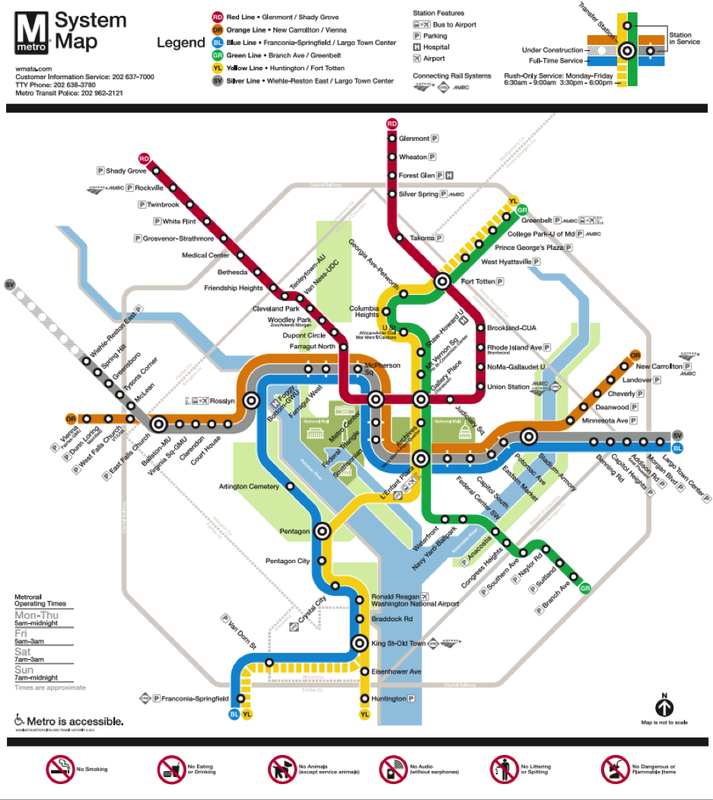 The Washington Metropolitan Area Transit Authority (WMATA) provides a helpful Trip Planner tool to help you plan and time your commute, and to determine the cost of your trip. Refer to the WMATA website for a list of fare prices, and instructions on how to purchase fare cards. To access campus from College Park Station, exit the station toward Paint Branch Parkway (up the short escalator, leading to the bus terminals and the parking garage). From there, head to the 104 College Park Metro Shuttle. This FREE shuttle circulates from College Park Metro Station to the Regents Drive parking garage on the University of Maryland campus at regular, ten-minute intervals throughout the week during the school year. The University of Maryland provides an interactive map for easy navigation of our campus. If you are driving into campus, paid parking is also available at the Stamp Student Union and in the Regents Drive parking garages, as well as on some surface streets. Please visit the Department of Transportation Services (DOTS) website for information on rates and methods of payment.